Last month, I ran a workshop on hiring for the Boston chapter of the AA-ISP. 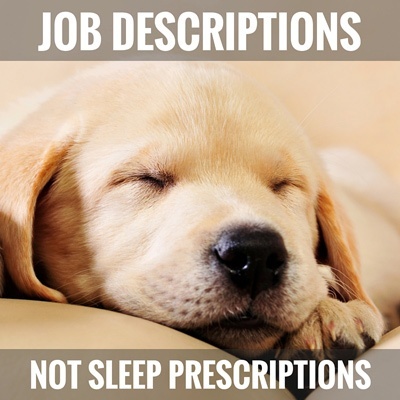 We decided to focus on job descriptions. Three companies stepped up to have their SDR job descriptions workshopped. Let’s take a peek at what was created. Ryan Stanton, Director of Outbound Sales, for TraceLink delivered the following. Have you ever saved someone’s life? You will here at TraceLink. Seriously. Our technology protects patients’ lives across the world—it’s estimated that well over 100,000 people die per year due to counterfeit or compromised medicine, and countless others have their health adversely impacted. Our Sales Development Reps are kick starting their careers at the (lucrative) intersection of two of the hottest business sectors: High Tech and Healthcare. That means accelerated career growth for you! Wow. The core of that message is extremely powerful. I love how Ryan positioned TraceLink as “at the intersection” of two growing, important, and lucrative industries. Powerful! Next up is Kara MacKintire a Talent Scout at Rapid7. All aboard! In the late '90s commuting on the R7 train into Midtown Manhattan, our two founders knew that security was going to be the future. Their grit and dedication are have driven Rapid7 to the forefront of the security industry today. At the core of what we do is a fun and inviting community where everyone has the opportunity to do what they love. And there's a lot to love here. I personally like the train theme in this one. It makes you think fast moving and everybody headed in the same direction. Rather than something like "founded in 2000 by seasoned software executives, Rapid7 is a leader in …" This story pops. It makes you want read on. And finally, we have Lynn Pieczarka, Sales Support Manager, at MathWorks. MathWorks helps today’s top minds create tomorrow’s innovations. If you want to be part of conversations that will help to shape the future of cutting edge technologies, we have the career path for you. Within your first six months, we’ll provide a foundation of sales skills you can build your entire career on. This appeals to me because it emphasizes that new hires will be provided with foundational skills training. No sink or swim – they’ll give you the support and development you need to be successful! What’s at the intersection of what this role offers, what it is that candidates are looking for, and what’s truly unique about your company? Edit aggressively. A great job description is as much about what you cut out and was you put in. If you have a job description you're particularly proud of, I’d love to see it. Please post a link in the comments. Make sure to point out why you think your job description sells the position. Trish is the President & Chief Strategist of The Bridge Group, Inc. and author of the #1 Amazon best-seller The Sales Development Playbook.